I go to the same post office at the same time of day on the same day and the same man helps me. His name is Dustin. He has a long ponytail, round glasses and looks like a story book character. After each customer Dustin taps on the counter twice with his knuckles and then says "Hello, what can I do for ya." He said this same thing to me in the beginning too. When I walk in the door now, Dustin says "good afternoon young lady" and we will carry on a conversation until all my mail gets tagged and weighed and stamped, which can take a long time some weeks. Dustin was very curious about my mail when I first started seeing him, he'd ask a question each time I came in, things like "is this an online thing" or "do you make this stuff" or "what's in here"? He wondered about the inside because he always saw the outside.. The question had been brought up "why do you spend so much time on the part that gets thrown away?" well, that's easy-- Dustin is the second set of hands my envelope touches, after ours I have no idea how many hands touch it and how many eyes see it. I have no clue what the people who see it believe. I have no idea who has hurt them or what grudges they are holding. I don't know their story or what lies they believe about themselves. I don't know if they drink too much or cuss like a sailor. I don't know if they go to church, know jesus or if they hate God. I want them to take in the truth of the envelope. I want it to stick in their mind---I make the outside pretty because I want it to stand out, I want them to look and inspect it. There's always a message on the envelope that's encouraging. Sometimes scriptures, sometimes kind words, and sometimes YOU ARE ENOUGH. That's my personal favorite. 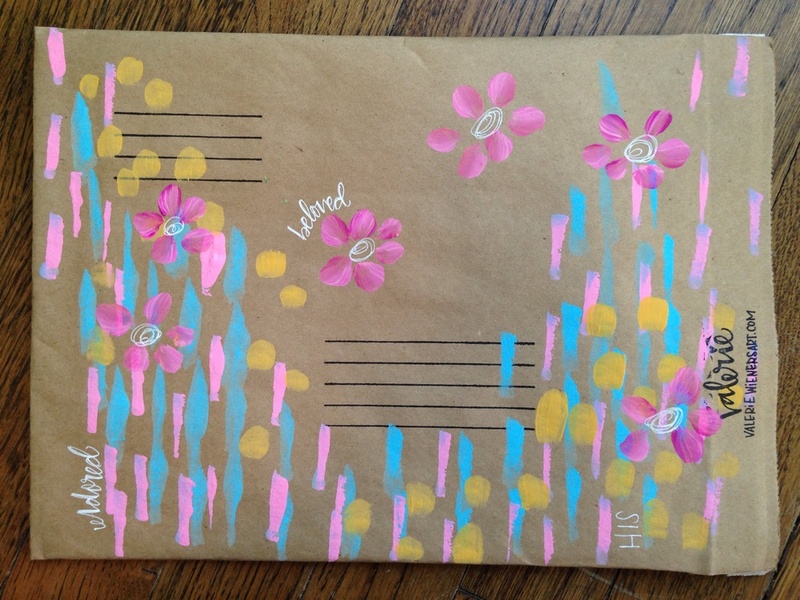 Each time I make an envelope I imagine myself as a mail carrier 6 years ago. 20 year old Valerie was Hopeless and had nothing to encourage her. She knew she was worthless and believed it. 20 year old Valerie didn't know how to not be an addict, 20 year old me knew I was going to die soon. 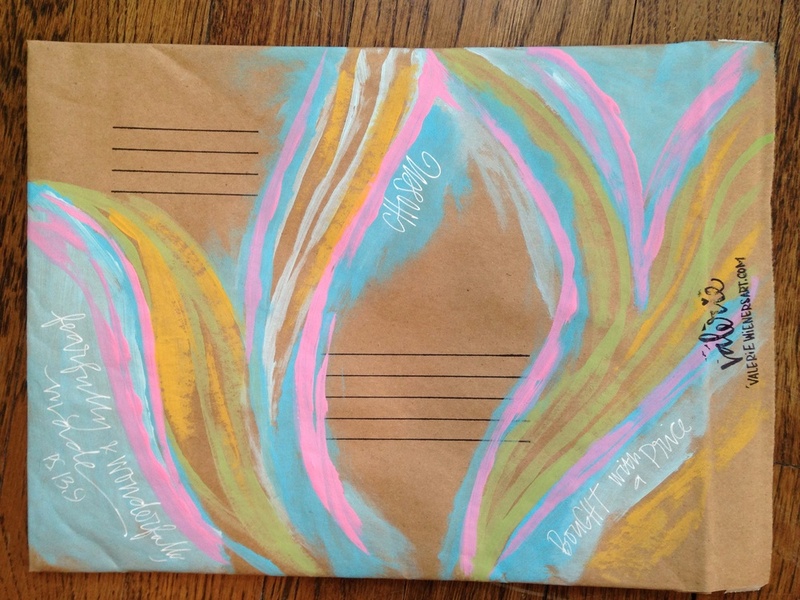 If I was a mail carrier at age 20 and I happened across one of these envelopes, it would have made my day because I'm a very visual and artsy person. I would have smiled and I would have read the statement YOU ARE ENOUGH. So often even now I find myself wrestling with that statement and writing it 100 times a week is a good reminder that yes, I am enough. I imagine that if 6 years ago I would have seen that envelope and read those words and saw a website, I'd probably go see what that website was about. Once I did start looking through it I'd see that the creator of that pretty envelope had a very dark past and made terrible choice after terrible choice. In the about me section I would find that she was a drug addict and struggled with a lot. I'd see that she went to rehab too BUT I'd see that things are different for her now. I'd see that she writes a lot about Jesus and that she doesn't look like a drug addict anymore. After scrolling down and reading some posts if figure out a lot more about her and how imperfect she is and how she still clings to the thing that will satisfy the hole because she knows now that nothing else will. My envelopes are on a mission. Each time you make an order or I write a letter to someone I'm sending it to you but I'm also sending out little rectangles of hope to them, the mail carriers and everyone else who sees it before it hits your mailbox. Maybe one of these days a mail carrier will send me an email and say that my envelope made a difference in their life and that's what I hope. I'm trying to share jesus one rectangle at a time. I spent an hour creating 11 painted envelopes tonight, the next 11 orders are in for a real surprise with this batch, they look really nice. I also would like to say thank you, seriously... Thank you! I have loved watching this business grow and I wouldn't have been able to do it without your support. I often think how much my life has changed because if Jesus and I am so thankful. I'm thankful that there is grace and that God never gave up and that through people on earth I saw Him. I'm often reminded of the verse in Joel that says He will restore the years the locusts have eaten... He is a restoring, transforming and redeeming God and I am so very thankful for that. Posted on May 5, 2014 by Valerie Wieners.